Every now and again an invention comes along that is so brilliant, it literally changes the way things are done. The cotton gin. The Jacquard loom. The sewing machine. Live mannequins. It’s done one way until the innovation, then it’s rarely done that way again. Such was the case with Ebenezer Butterick and his graded patterns. Now you probably recognize the Butterick name even if you don’t sew. But what you may not know is that in the late 19th Century, the two biggest names in fashion were Charles Frederick Worth and Ebenezer Butterick. Worth created haute couture for the classes; Butterick created sewing patterns based on haute couture for the masses. At the height of the Butterick fashion empire in the 1890’s, they were the second largest printer in the United States after the U.S. Government, with stores in every major city in the world. But I’m getting ahead of myself. Let’s start at the beginning, so you can understand how this kitchen table idea became a multi-million dollar fashion empire in less than five years. It was 1863. Clothing stores with ready-to-wear apparel were rare and expensive. You could either make your clothes yourself, or you could pay someone to make them for you. If you made them yourself, you had the option of cutting the fabric freehand, or manually grading (scaling up or down) the one-size-fits-all adult patterns available at the time. Either way, it required extensive pre-work. But it was how things were done. Until Butterick came along, that is. Ebenezer Butterick was a bespoke tailor in Sterling, Massachusetts. He made custom-made clothes for men of wealth, while his wife, Ellen, made the family’s clothes. One night after dinner, Ellen pulled out her sewing materials to make a gown for their infant son. After spending time making all the necessary calculations to scale down the adult pattern to fit the baby, she remarked how much easier it would be if she had a baby-sized pattern to begin with. Ebenezer thought about it. He scaled clothing all the time in his business, but graded patterns for the home sewer? It was a novel concept…with LOTS of profit potential. He experimented with different pattern materials and decided against using cardboard – the most popular pattern material at the time – because it was too bulky. He went with tissue paper instead, because it was lighter and easily mailed. He did a handful of patterns for boys and men, intending to sell them by mail order. He then bought ads in a Boston newspaper, and waited to see what would happen. He was inundated with orders. Apparently, Mrs. Butterick wasn’t the only one who hated scaling down adult patterns for kids. Members of the Butterick family jumped in to help and cut, folded, and mailed the patterns from Ebenezer and Ellen’s home in Sterling. Within six months, they expanded into a nearby house, and less than six months after that, they moved to New York City. Ebenezer needed skilled workers and industrial printing equipment, and the best place to find both in abundance was New York City. With his creation and fulfillment processes in place, he began putting ads in newspapers all over the North East. Particularly when, following a trend that swept Europe, Butterick introduced a pattern for the Garibaldi suit. Garibaldi was an Italian general, and his loose, casual uniform became an instant fashion sensation among young men – much like James Dean’s jeans and t-shirts a century later. Boys saw Butterick’s ads in their local paper, then hounded their mothers to make them a Garibaldi suit. It made Butterick a household name. In 1866, Butterick finally added women’s and girls’ patterns. Ebenezer had resisted as long as he could, because fitting women’s bodies was much more difficult than fitting men’s, and the clothing was much more complicated. But the demand was there, so he finally relented. After encouraging initial sales, he decided to go all out on the marketing – in a bold, revolutionary way. 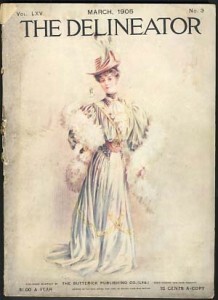 He introduced Butterick’s first magazine, Ladies Quarterly of Broadway Fashions, in 1867. It showcased Butterick patterns and gave the latest fashion news. It also changed fashion forever. Because for the first time in history, middle class women had easy, affordable access to new fashions. Butterick patterns not only showed women the latest trends, they also taught them, step-by-step, how to recreate the looks themselves. All from the comfort of their own home. Orders flooded in – from all over the world. 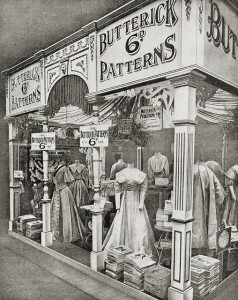 Butterick added a monthly bulletin, Metropolitan, in 1868, and a pattern catalog, called The Delineator, in 1873. The Delineator quickly turned into a general interest magazine for women, and became the top fashion magazine in the U.S.
By 1876, E. Butterick & Co. had 100 branch offices and 1,000 agencies throughout the U.S. and Canada. They soon found their way to London, Vienna, Berlin, and Paris, where they sold more Butterick patterns than any other place in the world. The Parisiennes loved them. Because Ebenezer took his role as the champion of the home sewer very seriously. He had a trend team in Paris who reported back to him four times a year. They’d bring the latest fashions from the houses of Worth, Lanvin, Boistay, Raffin, Laborde, and others, and the pattern team would study the clothes and pull them apart to see how they were made. Then they’d reassemble them in muslin and debate whether they were right for the Butterick customer. Those that made the cut were made into patterns and packaged with complete instructions. Home sewers loved them. So much so, that by the 1890’s, E. Butterick & Co. was the second largest printer in the United States behind the U.S. Government. Their 86 printing presses worked around the clock to turn out millions of patterns and 32 periodicals per year. The bootstrap business that began that night in 1863 had become a fashion empire in less than a generation. But they weren’t done yet. In 1903, construction began on the Butterick Building at corner of MacDougal (now Sixth Avenue) and Spring Streets in downtown Manhattan. Louis Comfort Tiffany designed the interiors of the 15-story Beaux Arts building, which became the jewel in the crown of the Butterick empire. Meanwhile, The Delineator magazine had become “the” magazine for the modern woman. It covered women’s fashion, home fashion, women in education, and women in various professions. It also carried some of the best fiction and non-fiction of the day. It was geared to intelligent, progressive women, and eventually reached a readership of more than 1 million. Ebenezer Butterick died in 1903 at age 76. 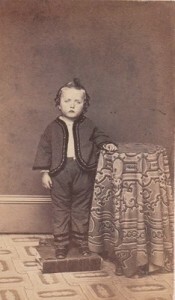 Ellen had proceeded him in 1879 (age 53). With his passing, things began to change – but not for the better. Other companies had begun to get into the pattern business, most notably Vogue. 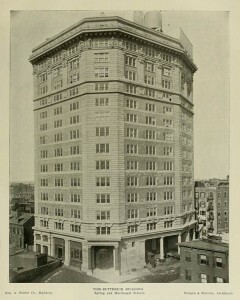 The magazine had started in 1892 as a local fashion publication for and about New York high society, but quickly grew in scope and prominence when it was bought by publisher Condé Nast in 1909. Nast originally sold patterns through the magazine, but made Vogue Patterns into a separate business in 1920 with separate publications. While Butterick patterns were geared toward the middle class, Vogue patterns catered to the upper class and those who aspired to it. 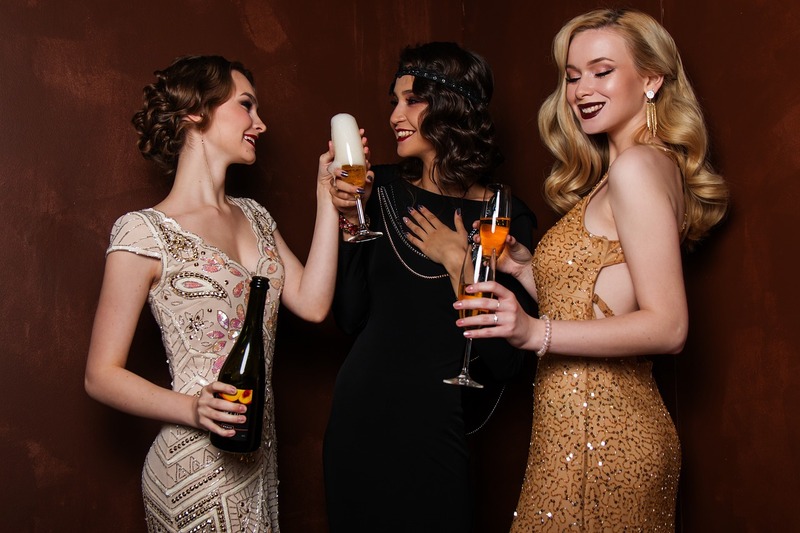 Both pattern companies took a big hit in the 1920’s when the ready-to-wear industry began to gain ground. The loose chemise-style dresses of the time could be made cheaply and easily, and women bought them without a second thought. Why sew when you didn’t have to? The Depression sent many women back to their sewing machines to economize. But after posting their best year ever in 1922 – $15 million ($200 million today) – Butterick was nearly bankrupt by the mid-1930’s. Their once powerful workforce of 2,000 was down to 500, and they ended up closing down The Delineator magazine and selling the Butterick building in 1937. When World War II arrived and the government enforced strict rations, Butterick again floundered and nearly shut its doors. It managed to stay afloat because of its home fashions division. 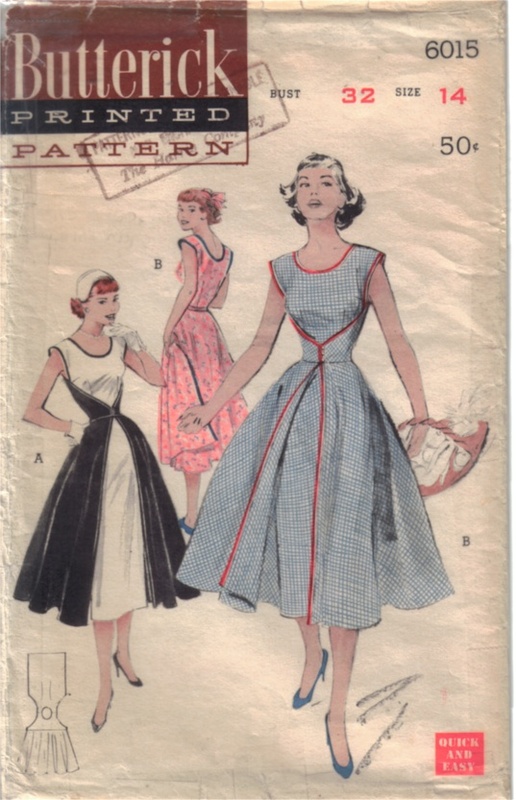 Finally, in the spring of 1952, Butterick found themselves with an unexpected hit as Pattern #6015 – the “walkaway dress” – became their biggest seller since the Garibaldi suit 85 years earlier. Ridiculously chic, its construction was so simple you could, “Start it after breakfast and ‘walk away’ in it for lunch.” The wrap style flattered a variety of figures, and the pattern was so popular, Butterick shut down production of all other patterns to fill the back orders on #6015. The 1960’s were a boom period for home sewing, particularly among teens. Four out of five teenage girls sewed, making nearly 70 million garments a year, according to a Barron’s report. Nearly 44% of U.S. females ages 12-65 sewed in the 1960’s. But that was the “last hurrah” for sewing AND Butterick. Because in the 1970’s, women stopped sewing. They went off to work as their sewing machines gathered dust. By the 1980’s, most schools stopped teaching home ec and sewing. From the 1990’s onward, it became cheaper to buy clothes than to buy the fabric and make them. Today, sewing is more of a hobby than an essential life skill. While there are certainly many avid sewers, most people sew to cut costs on expensive non-essentials like costumes and home décor. Hardly anyone makes their own clothes any more. It’s a far cry from Butterick’s heyday when women eagerly awaited his pattern books. But it doesn’t make Ebenezer’s contribution any less noteworthy. It’s fascinating how one breakthrough can lead to so many others. Isaac Singer patented his sewing machine in 1851. Charles Frederick Worth founded the House of Worth in 1858. 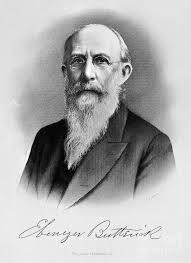 Ebenezer Butterick began making graded patterns in 1863. All three were landmark in forming the modern fashion industry, yet after centuries of sewing, they all happened within a 15 year period. To remind you that things were not always as they are today. One hundred fifty years ago, clothing creation was a chore. You either paid someone else to do it (expensive), or you did it yourself. If it weren’t for Ebenezer Butterick and his scalable patterns, fashion might still be the purview of the rich. And wouldn’t that be a shame for generations of fashion lovers? 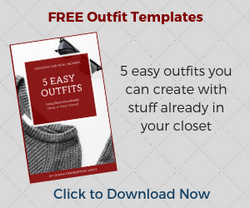 Diana Pemberton-Sikes is an image consultant and author of Wardrobe Magic, an ebook that shows women how to dress well whatever their age, shape, size, or budget. Download Wardrobe Magic right here. It’s so sad that women do not sew like that did in the past. That was extremely interesting Diana! I was one of those girls who sewed in the 60’s and I’ve loved looking at pattern books all these years. Thanks for that article. Thank you for writing such a fascinating article! When I was a preteen (in the 1960’s) I fell in love with the Mod fashions that were so hip at the time (boy, am I dating myself!). My mother informed me that they simply could not afford my taste in fashion so if I wanted to dress like that I would have to learn to sew. Luckily for me, I was moved to a new junior high that had a brand new home economics department taught by a home ec teacher who was VERY skilled in teaching sewing and cooking. There were several tables with new drop down Singer sewing machines in them and at least 3 new full kitchen set-ups in the classroom. I did indeed learn to sew my own clothes and cook. I got to the point when I was in high school where I could make an A-line skirt with a zipper and waist band from a pile of cloth to competed and hemmed in 45 minutes! The local fabric store sold lots of 1 yard+ pieces of fabric left over from the bolt so I would make myself a new outfit every week for very little money. I once saw a fabulous Mod style dress in the department store that cost $50 (a small fortune for 1 dress in those days, especially for a teenager!) and I found the exact pattern and made it for $6 – Yes, that’s correct- $6! An impossible fete today. Although I loved Vogue patterns, Butterick patterns were my favorite because they had interesting styles and were much easier to follow. Thank you so much for this wonderful trip down memory lane! You’re welcome! Thank you for sharing YOUR story! So very fascinating! Thank you for sharing. I grew up in the 1970’s with my mother sewing all of our clothes (in a rural and poor area) and am thankful for the skills. I always took graded patterns for granted. Can’t begin to imagine what it was like before that having to scale all the time! I think the next big thing in women’s fashion will be ordering clothes from websites like eshatki where you can order semi-custom-sized and custom-sized made-to-order clothes for about the same price as purchasing ready to wear. I also grew up with my mother sewing a lot, mostly formal apparel (my father was an officer – they partied A LOT). I found it tedious to pin and cut out patterns – I can’t imagine having to grade everything as well. Nice article! I am one of those girls who made lots of my clothes in the 60s and then later used my skills primarily as a costume designer. And indeed when fabric got so expensive – it didn’t make sense to sew much. I think the quilting craze saved the fabric store business. What I see these days however in ready-to-wear is clothing that is so ill-fitting that most women are frustrated. Those double sizes (12-14 medium) are hard to figure out for one things. But on top of that the design dart in the bodice has been rotated into the armhole and then eliminated by a lot of manufacturers. Women complain to me about how these cheaper blouses and shirts don’t fit and they don’t understand what has happened. I have to alter everything I buy – my fitting skills come in real handy for that. Fit IS a HUGE problem for most women. But, since they never learned to sew, they can’t easily fix it. You have a tremendous advantage with that. As another woman wrote in the comments, online customization sites like eShakti.com can help with fit. I hope it’s the next trend in online shopping. This is a great article about the history of Butterick and home sewing patterns. While the majority of women don’t sew today, there is a growing community of home sewers who are focused on fashion sewing. Many of them are teens and young adults who use sewing as a creative outlet and a way to express their own sense of fashion. Others are somewhat older and simply fed up with the poor fit and lack of interesting design that pervades the RTW industry, and they’re also more interested in putting their own skills to use to create unique wardrobes for themselves that they’ll truly love for years–instead of buying tons of cheap clothing that will fall apart after a handful of wears and then be trashed or donated. It’s true that you can’t sew a dress–or anything else–less expensively than you can buy it today. But improved fit and personalized design make the expense of money and time worth it for dedicated home sewers. I sew mostly historical costumes for myself, but I also sew dresses and tops for everyday wear that I could never find in a store–and that certainly wouldn’t fit well even if I did manage to find them in a store. Glad you enjoyed the article! Thanks for your comment. It’s true – you’ll never get the fit from RTW that you do from sewing it yourself. You also won’t get the high end fashion look without spending a fortune. For some, it’s the only way to go.